Arthur was born in Newbury in 1892, the son of Alfred Musselwhite and his wife, Emma née Mathews. There were eight children in all and, relatively unusually for the period, all survived to adulthood. The first three: Alfred James (born 1885), Edith Jessie (1886) and Frederick (1888) were born in west London (Kensington and Acton) before the family moved to Newbury. Alfred senior scraped a living as a ‘scavenger’ (street cleaner), possibly employed by Newbury Borough Council for whom he was working as a carter by the time of the 1901 census. They family lived at 7 Bedford Place, a small alley off Bartholomew Street where Herbert George was born in 1890, followed by Arthur, Mabel Ellen (1894), Margaret Rose (1897) and Daisy Emily in 1902. Emma’s death, aged only 38, within the same quarter as Daisy’s birth strongly suggests that the two were related – childbirth was a dangerous event. She was buried in Newtown Road Cemetery, Newbury, on 5 July 1902. By the time of the 1911 census Alfred senior was still working for the council as a labourer at the sewage works and Alfred junior - still living at home, aged 27 – was working as a shop assistant at an ironmongers, quite possibly the same ironmonger who was employing 18 year-old Arthur as a porter. Arthur moved away from Newbury to take a job ‘on the trams’ at Porth in South Wales. Porth was the depôt for the Rhondda Tramways Company, which ran electric tramlines between Porth connecting the outlying Rhondda villages (eg Treorchy, Maerdy and Williamstown) with the railway at Porth. Owned and operated by the local Rhondda council this was probably a secure and not too physically onerous job – it is easy to see why a lad from Newbury might be attracted to the job, but it is far less obvious why a local lad was not employed, or how Arthur came to hear of the opportunity. 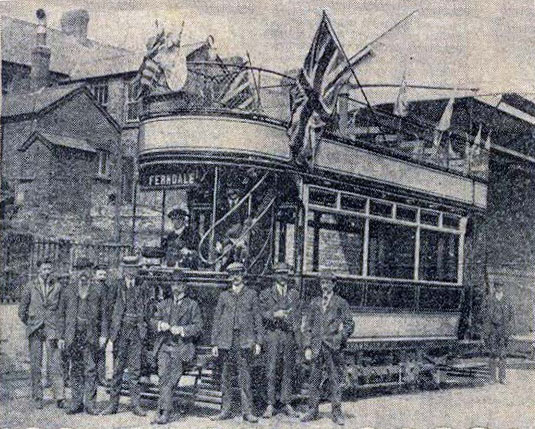 One of the Rhondda trams - Arthur would have known this vehicle, pictured here by the local paper at the start of its last run. Arthur responded quickly to the call to arms following the outbreak of war and enlisted on 2 September 1914. Despite the fact that he was living and enlisted in Porth, he was allocated to the Royal Berkshire Regiment. This may have been by his choice, though a large number of recruits from South Wales were sent to Reading in late September to join the newly formed 8th Battalion of the Royal Berkshires as the local regiments were not able to cope with the influx of recruits. The battalion spent the winter of 1914-15 in Reading, digging trenches in local fields and gradually looking more like an army unit as supplies of uniforms, rifles and other equipment began to catch up with the huge influx of new troops in Kitchener’s ‘new army’. It was not until August 1915 that the battalion was deemed ready to fight, but, unlike most of the Kitchener battalions, they did not go overseas as part of a new army division. A reorganisation of the Guards battalions into a Guards Division meant that a number of regular army brigades lost a battalion; the 8th Battalion, Royal Berkshire Regiment and the 10th Battalion, Gloucestershire Regiment were chosen to replace the 1st Battalion, Goldstream Guards and 1st Battalion The Scots Guards in the 1st Brigade, 1st Division. They would be fighting alongside seasoned regular battalions that had experienced a year at the front. Whilst this might be daunting they had an advantage over the battalions in the New Army divisions in being led by experienced staffs at brigade and divisional level. The following month the 1st Brigade was tasked with the capture of the southern part of Hulloch village as part of the first wave of troops launching an offensive in mining country north of Arras around the Loos-en-Gohelle. The Battle of Loos was a much larger scale offensive than any previous British attempt to break the German line, a scale that could not have been envisaged before a significant portion of the New Army was ready to take the field. It was also notable for the first British use of poison gas (chlorine), some of which drifted back into British lines. The 8th Battalion went ‘over the top’ at 0630 on 25 September 1915; they moved rapidly forward until they were held up by barbed wire entanglements immediately in front of the German front line. Many casualties occurred as they cut a way through the wire. Once through the wire the German line was taken with little opposition and they were soon charging into the second line, losing touch with the 10th Gloucesters on their right who were held up by more German wire. By 0800, they were in the third line, where the fighting was heavier, and then into the outskirts of Hulloch where house to house fighting stalled the advance. They had advanced some 1200 yards but could not hold on to all their gains – the Gloucesters were nowhere to be seen and the 2nd Gordon Highlanders on their left had also suffered heavy casualties. The Germans counter-attacked forcing the Berkshires back about 100 yards. They were the Prussian Guards we were dealing with and I can tell you some of us looked a little small against them. By 10 o'clock we had every one of their first set of trenches and soon afterwards the order came to advance. We took the first line of their second set alright and I went up with the second line to take their support trenches. Just as we were getting busy with our 'toothpicks' a bullet hit me in the right thigh, passing straight through and I toppled over like a shot rabbit. We got a long way through their lines, but they got reinforcements up. They opened a most murderous fire on us, both with artillery and rifles. The former inflicted heavy losses on us. One stream of Jack Johnsons coming over and stopping all supports coming up. The shells were bursting all around us; the ground shaking continually with the terrific explosions. It was terrible seeing one's pals falling all around us crying for help. Some of the wounded being dressed in our lines were blown to atoms by a shell. The roar of our guns massed behind our lines, the shells bursting and a huge mine of ours seemed to throw the ground from under our feet. Great masses were flung high into the air and blew that part of their line to smithereens. They used their gas against us, but with the latest smoke helmets, few casualties occurred from it. Though we lost heavily they lost very many more, their dead lying about everywhere in masses. It was the Prussian Guard opposed to us and there were plenty of helmets lying about. But we had our packs on and they were more than we could properly manage to carry or else I would have got a helmet. The decision was made to withdraw to the German communications trenches (Gun Trench and Alley Trench) and prepare them to defend against further counter-attacks. Somewhere in this maelstrom Arthur disappeared; he was counted among the 8th Berkshire’s estimated 493 casualties of the day. Pte A Musselwhite, 13544, B Co, 8th Batt Royal Berks Regt. Missing since September 25th. Information to Mr A Musselwhite, 13, Russell-road, Newbury. The appeal generated a response from one of Arthur’s comrades, Stanley Giddings, also from Newbury. Mr Musselwhite received the folowing letter from Sergeant Giddings, Theyton Towers, Hospital, Theyton Bois, Essex. - It is with deep regret that I have to inform you that your son was shot in the back. As he called to me saying that he was hit, I told him to get into the trench out of the way of the shells, and bullets, that were dropping in all directions. One of my signallers stopped and helped him to shelter, and all I can say is that he was very badly hit but I can assure you that he is not a prisoner of war. This is all the information that I can give you as I was hit myself shortly afterwards at about 7.30.a.m. on September 25th. 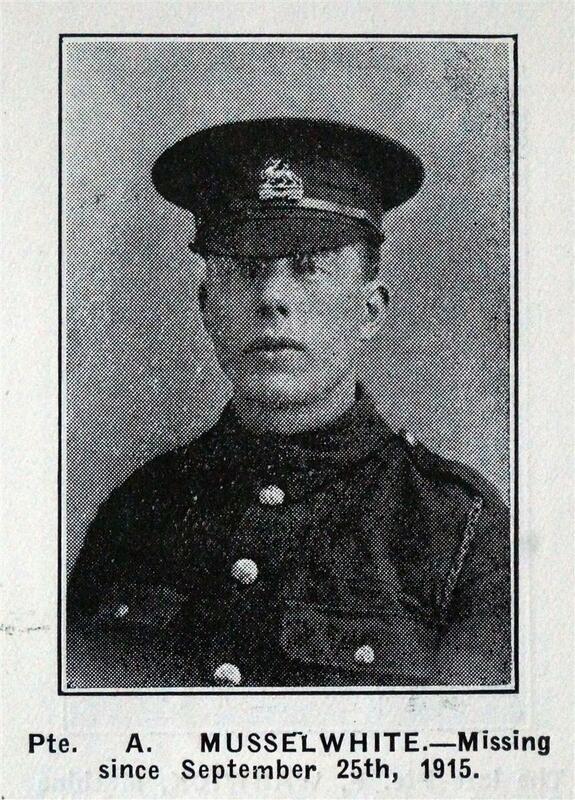 Sergeant Giddings recovered from his wounds and returned to the front; he died there in 1918. Private A Musselwhite, Royal Berkshire Regiment, missing since September 25th, 1915. His father, who lives at 13, Russell-road, received notice from the War Office to say they cannot find any trace of him. So it is presumed he is dead. The only previous intimation was that he was wounded on September 25th, 1915, and a Sergt Giddings saw him fall at the advance on Loos. Previous to the war he was on the Trams at Porth, in Wales, as conductor. He joined up soon after war was declared. His body was never identified, so his name is remembered on panel 94 of the Loos Memorial to the missing at Dud Corner just outside Loos-en-Gohelle. 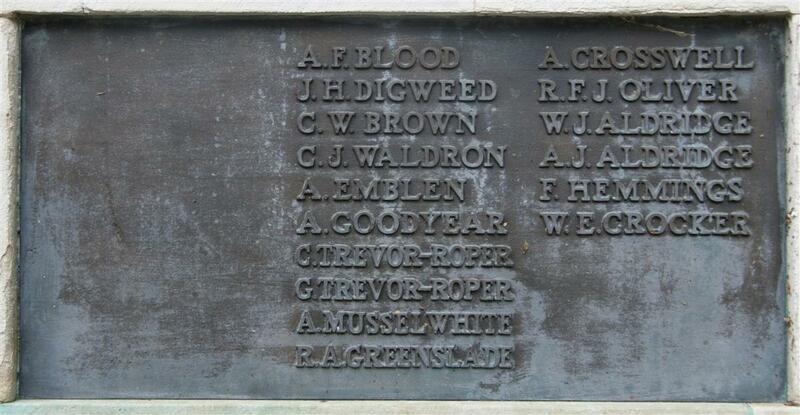 William's name on Newbury War Memorial. Locally he is remembered on tablet 8 of the Newbury Town War Memorial and on the parish memorial board and roll of honour in St Nicolas’ Church. The Battle of Loos was a message to Newbury that the war was going to be a tragic process; before Loos Newbury had suffered fewer than 50 fatalities in over a year of fighting; in the month that Loos lasted another 18 would be added to the sad list. And now it was the enthusiastic recruits of 1914 who were dying, not just the regular soldiers, sailors and reserves. Everyone knew lads who had signed up in the rush to serve; parents, siblings and children who had loved ones in France or in training had an awful foretaste of what might happen in their family. Fred Seward, whose account of the battle is given above, was wounded (as he describes) and repatriated for treatment in the UK. Although he survived his wounds were such that he was rendered unfit for further service; he was discharged from the army on 11 August 1916.